To be precise, happening this morning is the Cobra (Half-) Ironman 70.3 in Mactan Island, Cebu. My social media newsfeeds are flooded with Ironman updates from friends and teammates and I am pumped, vicariously relishing today's sweet culmination of months, even years, of hard work for these mighty triathletes. What exactly is a triathlon, and what exactly is the Ironman? 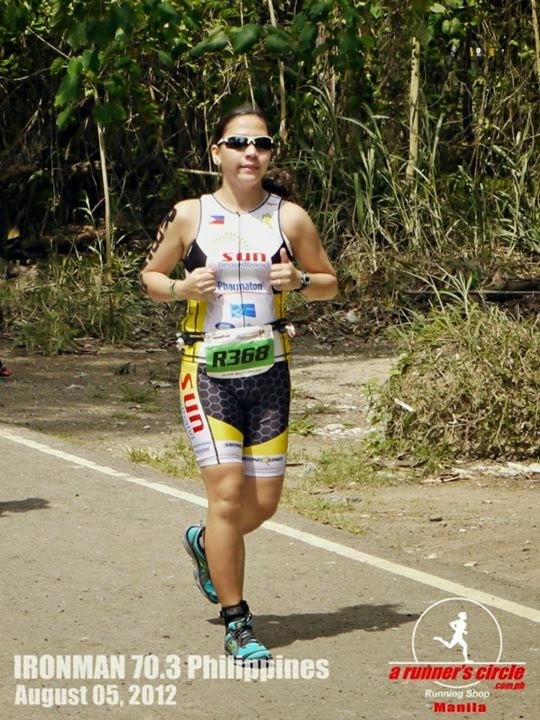 A triathlon is a sport composed of three disciplines -- swim, bike, run. In that order. 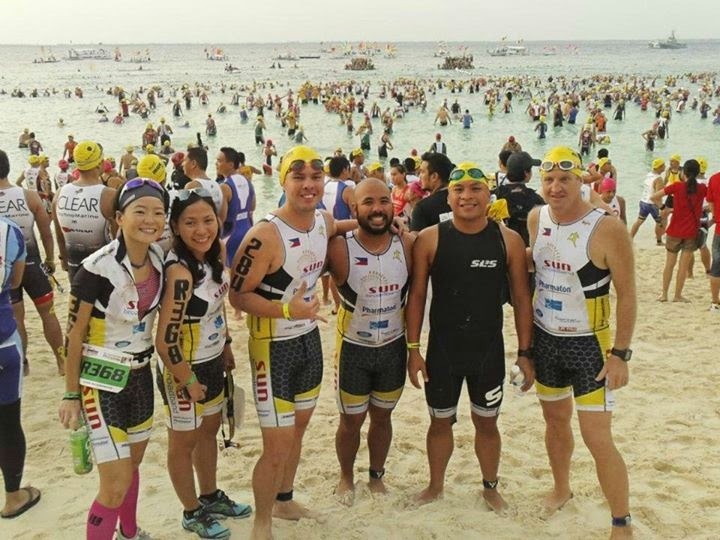 The Ironman is the world famous triathlon event, with immortal world champions and mere mortals like us convening annually in Kona, Hawaii to compete in a gruelling 3.86 km open-water swim, 180.25 km bike, and a marathon (42.195 km run) to top off all that craziness! Can you imagine doing that continuously under all kinds of harsh weather conditions for 17 hours? I can, and I crumble at the mere thought! While we don't have the full Ironman yet in the country, we do have the half-Ironman. Yep, the one happening now in Cebu. Half the distance but just as crazy-sounding, eh? My husband is there right now providing logistics and all kinds of support to our teammates. 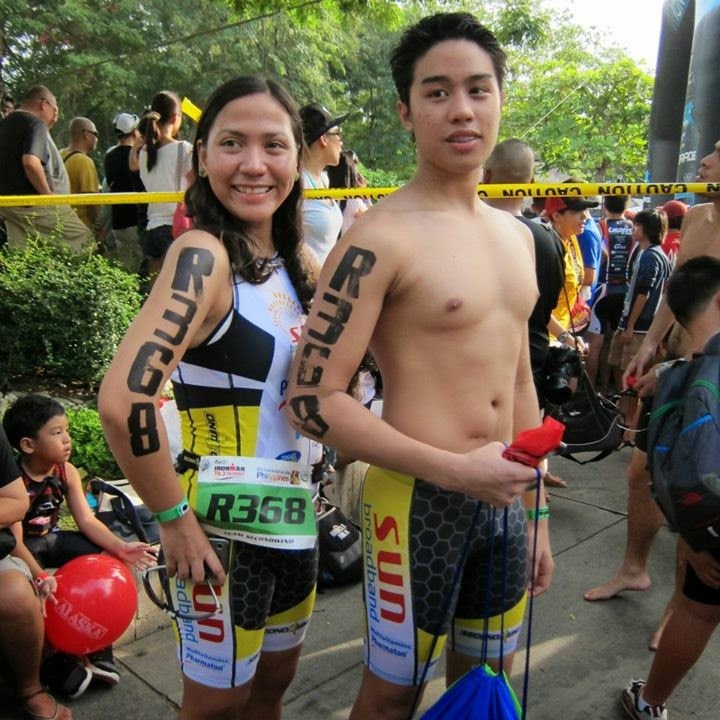 We've both joined the Ironman 70.3 (Cam Sur then Cebu), but we've only ever joined as part of a relay team, running the last leg -- the half marathon. Ironman 70.3 2012: With teammates before the gunstart (you can tell the atmosphere was highly charged with excitement). With Zach, my relay team's powerhouse swimmer. He was just a teen then! The sun was at its most merciless by the time I ran. I wore my body markings and my odd tan lines for months and months after. Of course, that entails a lot of determination, pain, pain, pain, (from training), hard work, rigid routines and spot-on time management skills, and a whole village of support from the husband, kid or kids, teammates and training mates, the entire household members, down to the nannies/helpers, with the work environment conspiring too towards that one big Iron dream. Training itself for the event is no easy feat, but I have an army of women in my circle, and even beyond my immediate circle, that inspire me a lot. It can be done. For now, I'll cheer on the bleachers sidestreets (or while scrolling my phone, actually), while carrying on with the top items in my priority list. As it is now, a half-Ironman distance is far down that list, but I do dream. Someday, someday baby!